We couldn't wait to see how our kitchen would come out. We had spent months planning it, getting every last detail defined (click here for the original plan). So we waited with baited breath to see how it would all come together. And we weren't disappointed! We love it! 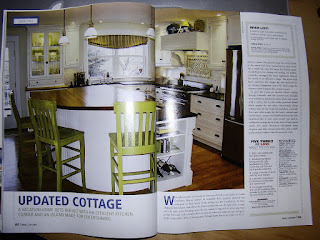 The custom cabinets, with their inset doors, were fabulous. 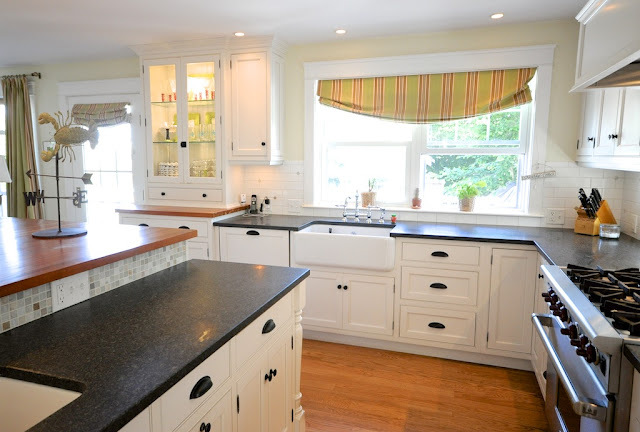 We finished them off by installing black hardware with a satin finish - to play up the New England style. 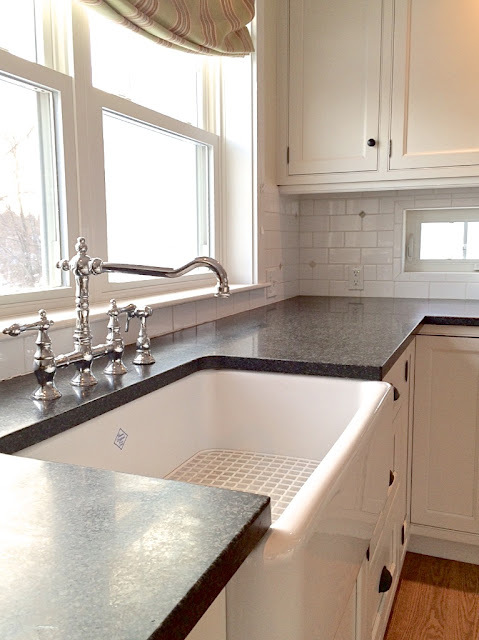 The countertop installation was probably one of our worst experiences of the whole project - but once the tile was in to hide the contractor's mistakes, they looked beautiful. We've done a Shaw porcelain sink in several of our kitchens, they are always a great addition. I love the idea that the same factory in England has been making them since the 1890's. And the tile? I couldn't be happier with the custom glass and marble tile that we installed. We did a focal point behind the stove, but installed marble 'dots' in the subway and also across the back of the island. 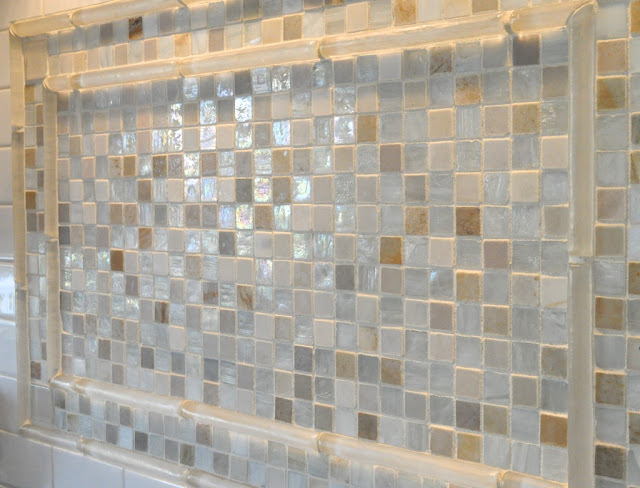 The marble tiles are random thicknesses, which gives it an interesting dimensionality (is that a word??). Our contractor Joe custom made the curved cherry butcher block top for us. Half of it came from some cherry that his dad had stored away for about 40 years. The rest was new cherry from a local specialty lumber yard. But within 6 months, the colors had all deepened and you couldn't tell the old from the new wood! 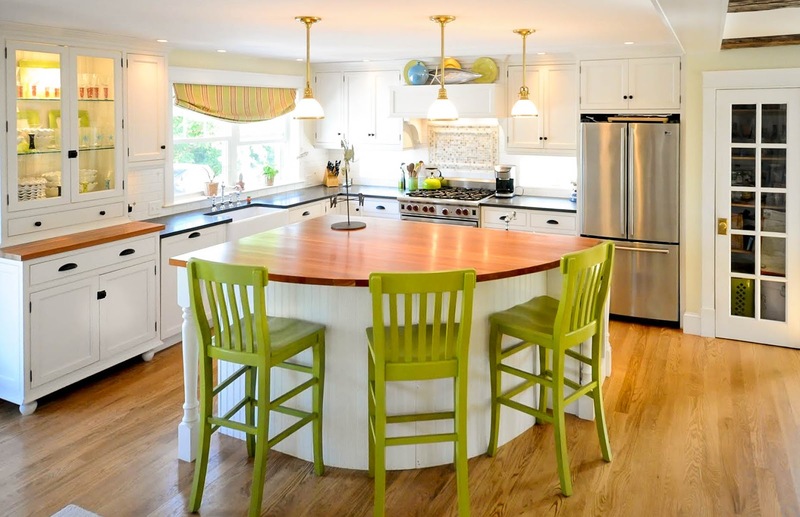 The island is big and provides an amazing amount of functionality. It hides the microwave on one side (and I do hate the look of a microwave!). It has a prep sink and the trash/recyclable bin on the other. side. 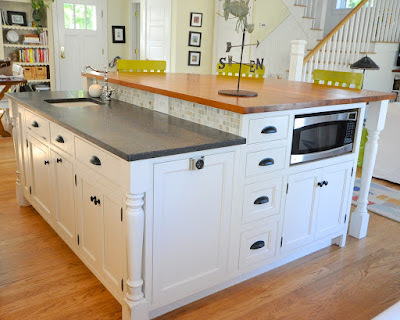 The extra counter space is really helpful, when we have multiple cooks in the kitchen. 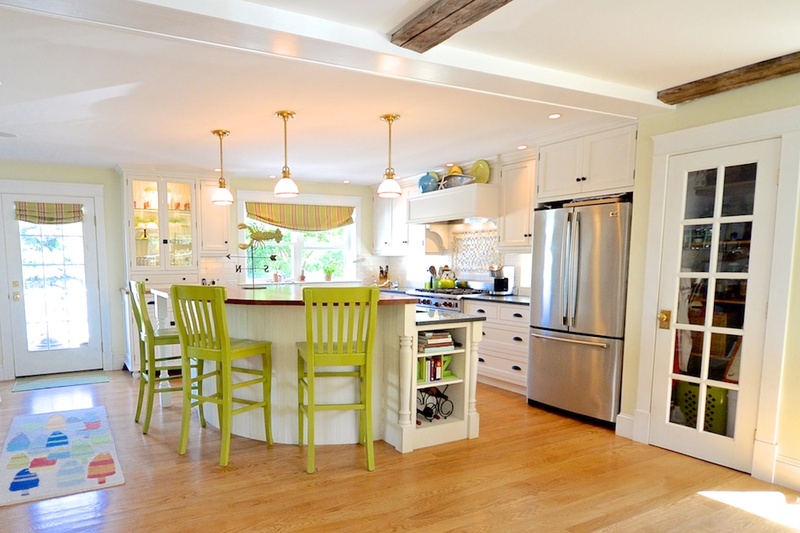 And of course the butcher block top gives us seating and lots of serving space for big parties. Adding the chunky legs on the corners and the built in bookcase gives it that true custom touch. The lighted cabinet is one of my favorite details. Robin Amorello, our designer, insisted that we raise the height of it a little bit above the countertop. 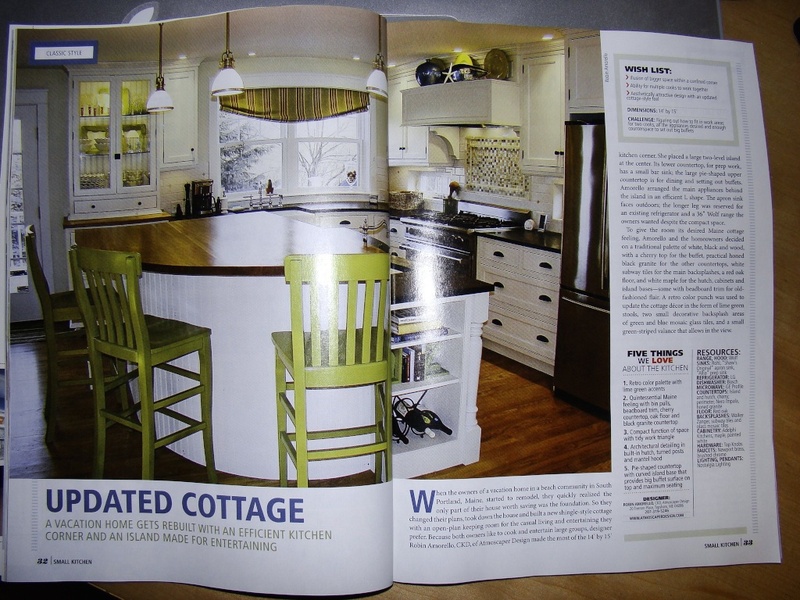 That was a great point - it helps make it look like a piece of traditional furniture, rather than a regular cabinet. 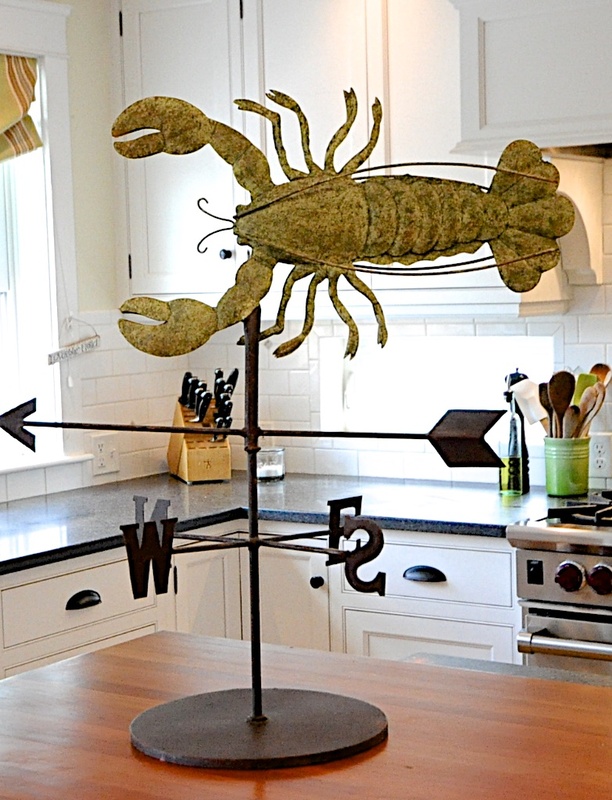 The lobster weathervane was a Mother's Day gift from our daughter. 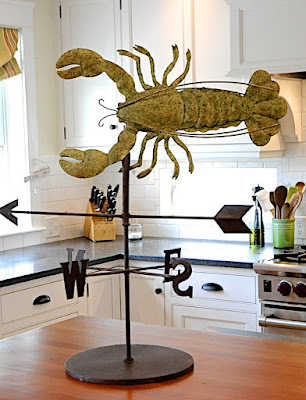 I love that special Maine touch that it provides. 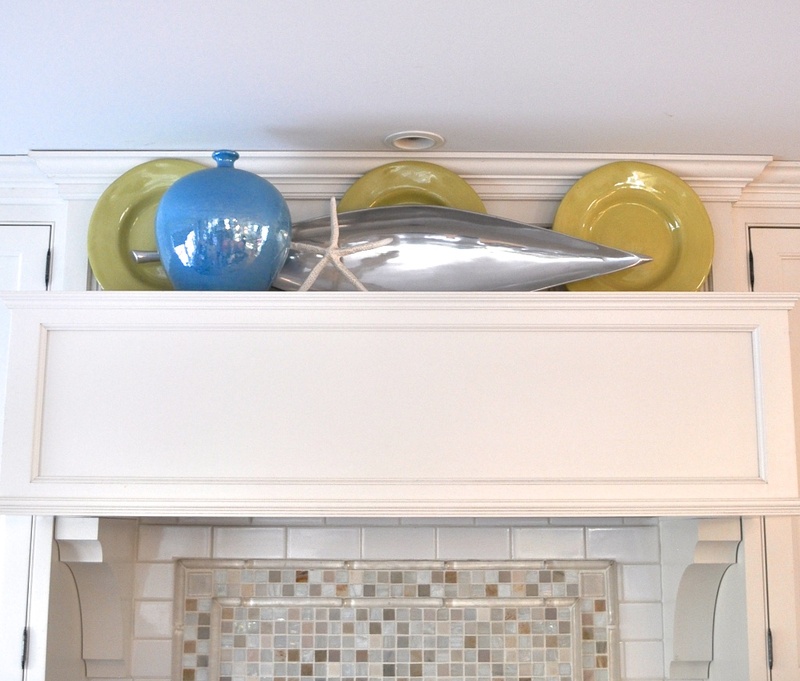 And the custom mantle cabinetry that we had built to hide the vent hood provides some nice display space for a bit of color. Speaking of color, the basic elements of the kitchen are very neutral. 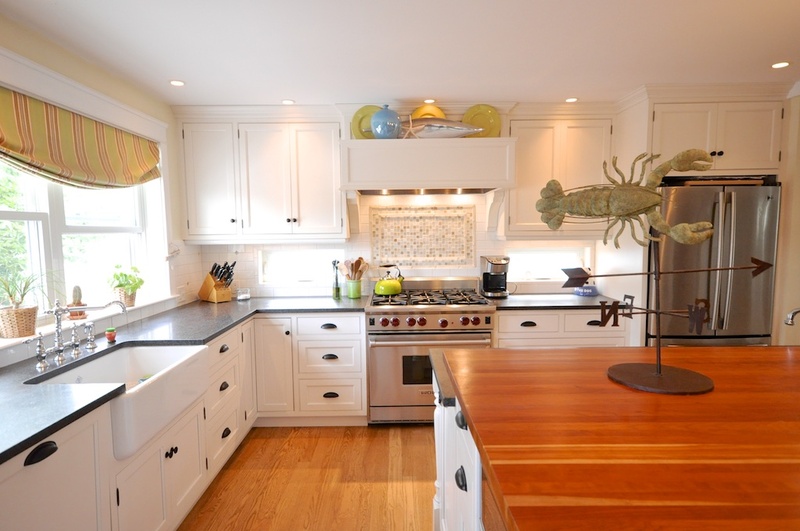 White cabinets, white subway tile with beachy glass and marble insets. The color is all done with accent pieces. So when I get tired of the color scheme (and that happens a lot), it will be easy to transform this kitchen with just a little investment! And I guess we weren't the only ones that liked it. 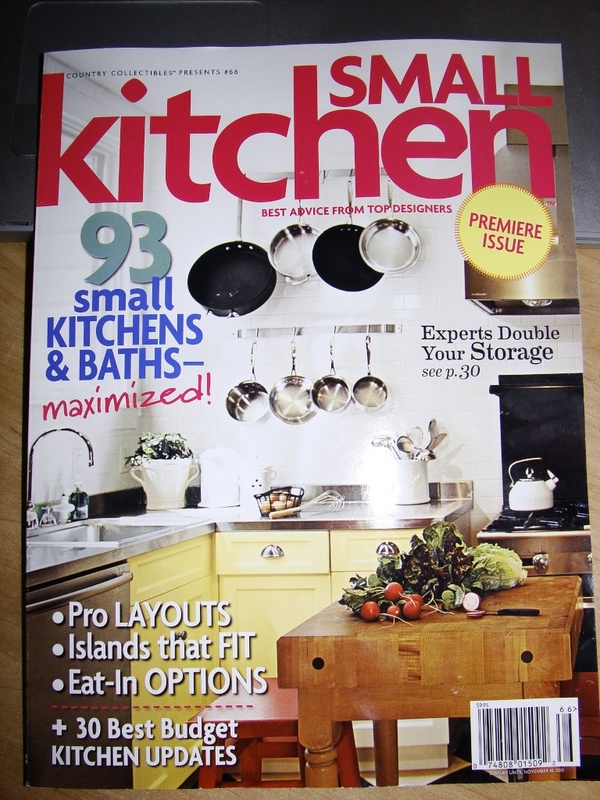 Shortly after it was completed, Robin called to say that a magazine wanted to use it in their premier issue. How cool is that? So what do you think? Was it worth all the detailed planning? That is beautiful! 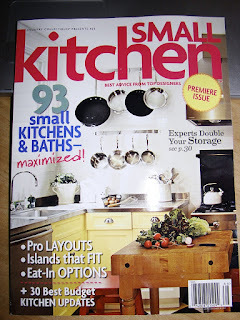 Mind me asking the sqft-age of the kitchen space? I'm curious how bigger the open space plan makes it feel than the actual size. Thanks so much! It's roughly 14 x 14. Not sure where I should count the edges! But the advantage of the open plan is that the stools can move out quite a bit. If we had walls, it would feel very different! Love, love, love this! The butcher block island with the prep sink area, built-in bookshelves, glass front cabinet, back splash, it's all beautiful! Congratulations on such wonderful design and execution! Oh my gosh!!! I love all of it, just perfect. 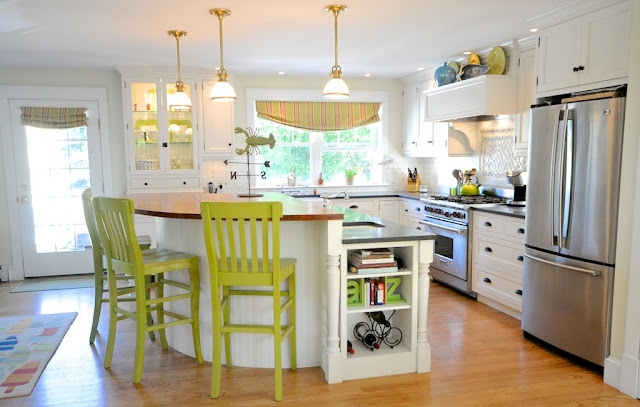 The glass cabinet is a wonderful addition and also the paned glass door. Definitely worth the wait. Thanks! And so funny you noticed the paned glass pantry door. It was a last minute decision and I love it - but I sometimes think we're not neat enough to have our pantry on display all the time!!! Just Say 'No' to Matchy Matchy! !